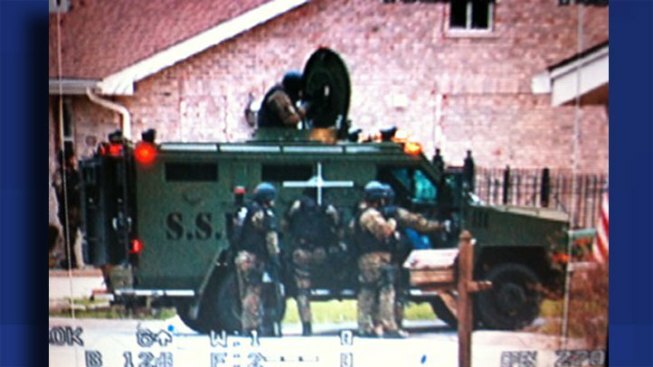 No charges have been filed against the man who was the subject of an hours-long "standoff" in Oak Forest on Thursday. The man was believed to be holed up in his Oak Forest home for several hours Thursday then found at Beggars Pizza, at 15600 Cicero Avenue, police said. He is now undergoing mental exams at Palos Community Hospital, police said on Friday. He is not in police custody, though the hospital must inform police when he is released. Police could not say whether he would be released anytime soon and said it was up to doctors. The ordeal began at about 4 p.m. Thursday, when police said they received a call from one of the man's friends. The friend told police the man was intoxicated and was trying to hurt himself. Authorities responded to the home and tried to make contact with him, believing he was inside. "We had cell phone contact with the suspect. He hinted that he was in the house, but he never actually said that." "You need to pick up your cell phone and speak to the officers now. We need to speak to you. Or pick up the phone in the black box we left near your door. If not, come out on the driveway with your hands up, you will not be hurt. Follow the instructions." Later, police said they received a call from the man. In speaking with him, they learned he was at a bar and had been there all night. Police located him outside the bar and arrested him. One neighbor said the man has a history with alcoholism and may have had difficulty finding steady employment. "If he's got a problem, I'm glad they did it," said Ray Sauerbier. "Its kind of strange to see someone in your back yard with a weapon." Police from Hazel Crest, Homewood, Tinley Park, Chicago Heights and other surrounding areas responded to the non-incident at considerible cost. "Easily in the tens of thousands of dollars," siad Chief Gregory Anderson.